effective precipitation | precipitation actually available to plants after runoff and evaporation. Observing vegetation is a fairly accurate way to determine effective precipitation over long periods of time. 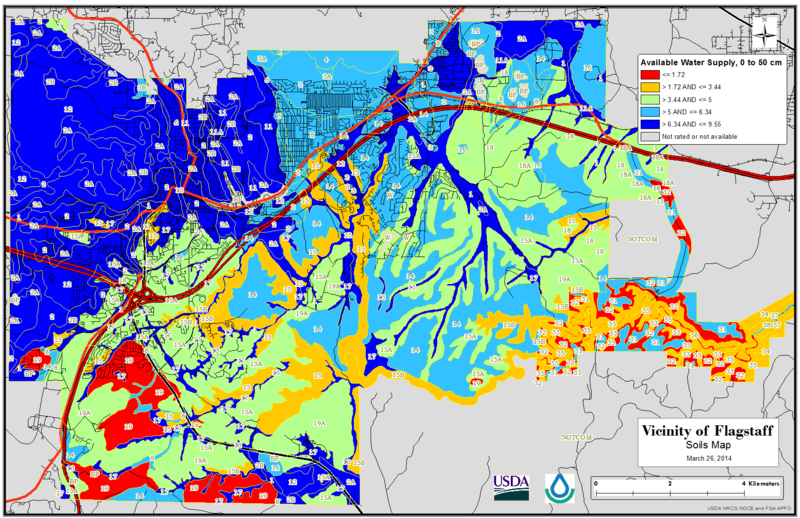 Based on vegetation type, the Natural Resources Conservation Service mapped average effective precipitation to produce this Available Water Supply map of selected parts of the Flagstaff area. Click on the map to see it larger on a separate page. Here in the Southwest, ponderosa forests develop where there are between 17 and 22 inches of precipitation a year—generally between 6,000 and 8,000 feet above sea level. Pinyon-juniper woodland occurs at lower elevations, where precipitation is between about 10 and 16 inches. However on south-facing slopes, intense solar radiation can lower the amount of precipitation that is effectively available to vegetation.